Furniture has a long life, providing you look after it! However, over the years, you may have chairs, tables or fine china cabinetry showing signs of wear or its initial finish has changed a lot. You may also want to restore old furniture bought at an auction, from an antique shop or a family heirloom. 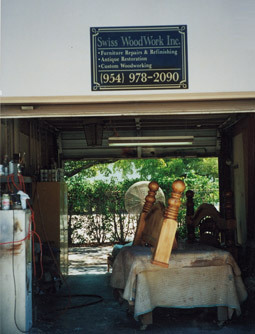 Swiss Woodwork Inc., established in Pompano Beach since 1990, is enjoying a very strong reputation for refurbishing furniture. Our skilled craftsmen, with a long experience in the trade, can repair or restore all sorts of furniture, no matter what the pieces look like, to your utmost satisfaction. Should you have any furniture worth being looked after, please contact Swiss Woodwork Inc. at 954-978-2090. Thank you for your future call! Swiss Woodwork, Inc. was created in 1990 by two partners: Philippe Maleszewski and Steve Casenhiser. They decided to use the name Swiss Woodwork because Philippe was born in Switzerland and came to the U.S.A. in 1990 at the age of 26. Philippe has a 4-year Business degree and 4-years Furniture Technical School in Geneva, Switzerland. His partner Steve was born in Ohio and worked all his life in the furniture industry. Together, they bring a tremendous amount of knowledge, experience, and precision to the task of repairing, restoring, or refinishing your fine or antique furniture.